45 cm of textual and other materials. Brigadier-General Raymond Pierre Marc Brutinel was born May 6, 1882 in Alet-les-Bains, Aude, France. His father was Louis Brutinel and his mother was Louise Maury. In 1903, Brutinel married Marie Calamun (1882-1952). They divorced in 1907 but continued to live together. Brutinel had a daughter, Raymonde (b. 1905) and two sons, Roger (b. 1904) and Pierre (b. 1909). In 1904, Brutinel and his family moved to Canada. They settled in Edmonton, Alberta but Brutinel also bought property in St. Albert. During his time in Alberta, Brutinel served as editor for Le Courrier de L’Ouest, Alberta’s first French language newspaper. He also surveyed routes and resources for the development of the Grand Trunk Railway. He discovered the coal-rich region around Pembina and is considered the founder of the area known as the Coal Branch. Brutinel was also instrumental in building the Interurban Railway between Edmonton and St. Albert, which ran until 1914. In 1913, Brutinel and his family moved to Westmount, Montreal. At the start of World War I, Brutinel joined the Canadian army and pioneered the formation of a mobile motorized machine gun unit, financing it himself and soliciting donations from other wealthy citizens in Montreal, Ottawa, and Winnipeg. In August 24, 1914, Brutinel enrolled the first recruits for the Canadian Motor Machine Gun Brigade, which was the first fully mechanized unit of the British Empire. The Motor Machine Gun Brigade played a significant role in many battles, including Vimy, Canal de Nord, and Somme. At the end of World War I, in 1919, Brutinel returned to Westmount, Montreal, only to discover that his lawyer had lost all of his assets. Brutinel moved to France in the same year where he worked and invested in different businesses including the Schneider-Creusot Company and the Banque Adam, and purchased several properties and vineyards. Between 1939-1945, during World War II, Brutinel worked with the French Resistance and developed an underground network to aid escaped prisoners of war and downed airmen, as well as send messages. Brutinel won many military awards, including the Distinguished Service Order (1916), Officier de la Legion d’Honneur (1918), Order of St Michael and St George (1918), Order of the Bath (1919), Croix de Guerre with stars and palm (1919), Commandeur de la Legion d’Honneur (1926). He earned seven citations to the Order of the British Army between 1916-1919, two citations to the Order of the French Army (1918), and a citation to the Order of the 42nd D.I. delivered by General Deville (1918). Brutinel was a naturalized Canadian citizen. He died on September 21, 1964 in his Chateau near Couloume-Mondebat, Gares, in France. Main source for biographical note from: Baylaucq, Dominique, and Jacques Baylaucq. Brutinel: The Extraordinary Story of a French Citizen Brigadier-General in the Canadian Army. Trans. Shelley Pomerance. St Albert: Arts and Heritage Foundation of St. Albert, 2014. The records were originally in the custody of Raymond Brutinel. After his death, custody transferred to his family. All records created after Brutinel's death were accumulated by the Brutinel family. Most of these records were then lent to Jacques and Dominique Baylaucq in France, who were conducting research on Raymond Brutinel in order to write his biography. All records were donated to the Musée by Brutinel's granddaughter, Anne Robillard, in 2014. Anne Robillard sent the records in her custody from Quebec, and the Baylaucqs sent the records in their custody from France. The fonds consists of photographs and postcards, Brutinel's personal papers, documents related to his properties, his family papers, and research material about his life. The photographs and postcards depict Brutinel, his family, his properties, and the Canadian Motor Machine Gun Corps. 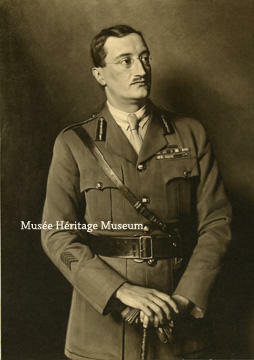 Brutinel's personal papers include records created during his lifetime, 1882-1964, which include general correspondence, operation reports from WWI, manuscripts and histories of the Machine Gun Corps, related newspaper articles, military and civic honours and certificates, and photographs. There are also legal and financial documents, maps and plans, and correspondence about purchase and sale of properties, Chateau de Couloume and Chateau de Bordaberry. Family papers include condolence letters and a collection of Brutinel's obituary from different newspapers. The research materials include different biographical sketches and manuscripts about Brutinel, genealogical research, and the Brutinels' marriage and divorce information. This fonds is arranged into five series: Photographs and postcards, Personal papers, Property, Family papers, and Research. Gift of Anne Robillard, 2014. Arrangement based on the item list provided by Dominique and Jacques Baylaucq. Item list by Dominique and Jacques Baylaucq available. Related collection items can be found in the collections database.